We all know very well that the popularity of the social network giant Facebook which is the most extensive social network on the Internet is indisputable. But, now according to the latest reports, it seems that the social network giant Facebook lost the title of “most popular”, as the most used instant messaging application, of course, WhatsApp has surpassed the Facebook and won the title of the most popular app on mobile operating systems. The popularity of the social network giant Facebook which is the most extensive social network on the Internet is indisputable. With a great form in the mobile world, the popular application of Facebook, of course, I am talking about the Facebook App is undoubtedly the most used and most popular. However, now according to the latest reports, it seems that the social network giant Facebook lost the title of “most popular”, as the most used instant messaging application, of course, WhatsApp has surpassed the Facebook and won the title of the most popular app on mobile operating systems. The social network giant Facebook’s decision to focus its bet on mobile platforms has been proven for some time now. The movement to these situations was logical, and the company took immediate advantage of it. 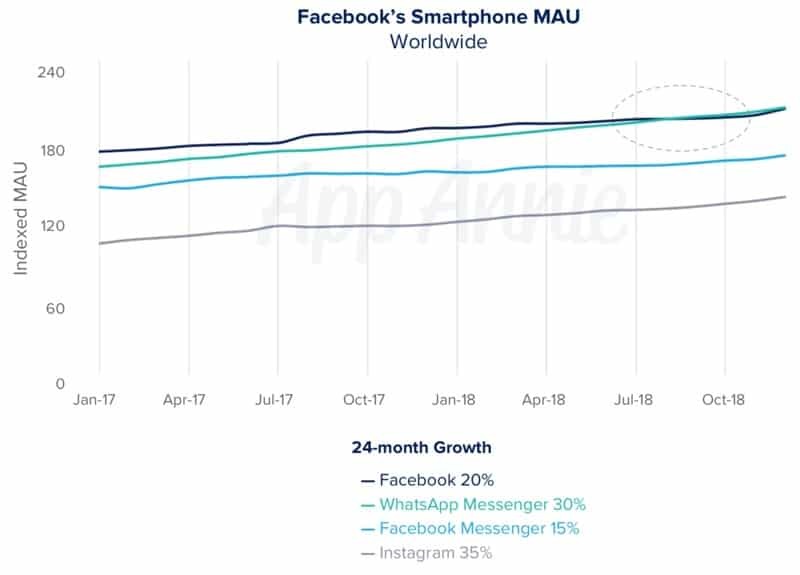 As the well-known standard in app analytics and app market data, of course, App Annie has just unveiled these data and also stated that with data for 24 months, the growth of the social network giant Facebook’s app was continuous. Overall, and over the last two years, the well-known and one of the most used social apps, of course, the Facebook app has seen its popularity increase by 20%. While the most used instant messaging application, of course, WhatsApp, jumped 30% to the same extent. Finally, and to win this stage, Instagram grew 35%; however, this app was below the other 2 Facebook apps and Facebook Messenger itself, in general use. While now if we talk about the USA then let me clarify that in the USA the most used instant messaging application doesn’t manage to win the crown, hence, the well-known Facebook app is still holding its title in the USA. However, here the weirdest thing about WhatsApp is that in the USA the most used instant messaging application, of course, WhatsApp is not even within the top 10 of most used apps. Then how WhatsApp managed to beat the Facebook App? Only due to the Asian and European countries, as the markets where the most used instant messaging app is most popular are India, Germany, Brazil, Indonesia, Mexico, the United Kingdom, Russia, and Spain. However, apart from all these things the most exciting thing is that Facebook itself controls both the apps and services and most users are available on both the platforms. However, this change is quite significant, as it clearly confirms the users’ demand for free and secure messaging solutions. Hence, it is probably the best time for the social network giant Facebook to monetize its platform with ads. So, what do you think about this? Simply share all your views and thoughts in the comment section below.